This morning we awoke to cold air temperatures, two inches of snow on the deck, heavy overcast skies, and some areas of fog. The ship was heading into the Lemaire Channel, a narrow passage between the Argentine Islands and the Antarctic Peninsula mainland. The temperatures here were at freezing, and the amount of ice floating in the channel was surprising compared to what we had witnessed so far. Small icebergs, bergy bits (smaller than 5 meters in height) and brash ice (small pieces floating together) littered the passage and the ship just pushed them away; smaller pieces of ice rafted together in the currents and created patterns. Even with the dark grey skies, the blue ice of the icebergs was surprisingly vivid. At the end of the Lemaire Channel there were many large icebergs in the distance. The morning stop was Peterman Island, inhabited by colonies of Adelie and Gentoo penguins as well as a small colony of Antarctic shags. The snow here had large areas of greenish or reddish snow; the color due to algae that grows in areas of permanent snow. The landing on a rock shelf was easy, and paths led to Gentoo penguin colonies to the right and left, with the Adelie colony further up the hill on the right. A path on the left led uphill to an overview of a small inlet that had an accumulation of grounded icebergs or various shapes. The afternoon stop was six miles further South at Vernadsky Station, a Ukrainian research base. 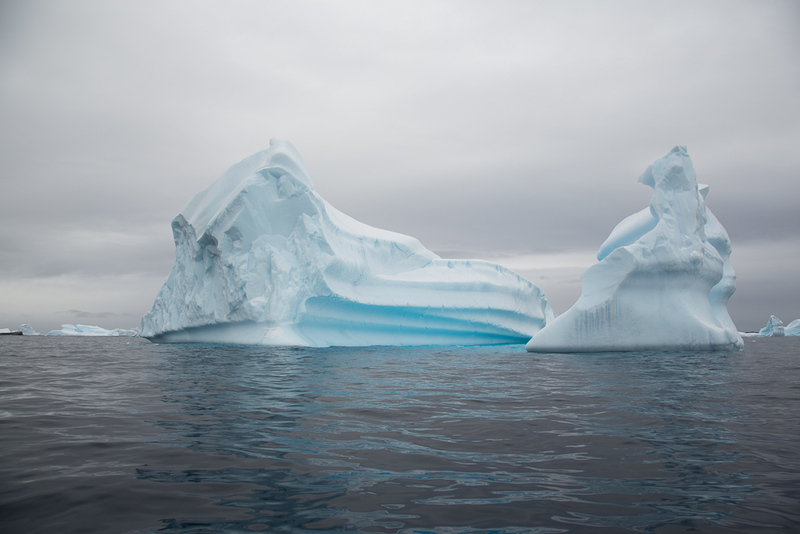 While waiting for our arrival time at the station, we spent time exploring the nearby waters which were filled with icebergs of every shape imaginable. These large icebergs were carved by currents, flipped over as the center of mass changed, and carved again. We never witnessed a large iceberg turn over, but it was easy to imagine how impressive it would be. The station was originally established at this site on Galindez Island, part of the Argentine Islands chain, as a British facility in 1954 and was sold to the government of Ukraine in 1996 for one pound. The UK had no further need of the station, and the cost of dismantling the base due to Antarctic agreements would be costly. Scientists from Ukraine lost access to Antarctic research facilities with the dissolution of the USSR, so it was a win-win situation. The Ukrainian Antarctic Center conducts projects in geomagnetism, seismology, upper atmospheric physics, meteorology, biology, and physiology research. Expanded to house 24 people, and operates the world’s most southern gift shop and public bar serving homemade vodka. One of the scientists conducted a tour of the facility which ended at the gift shop and bar, where we sampled the vodka. After our visit here, we returned to the ship and started our two day journey across the Drake Passage. It started off with high seas; I spent most of the time the first day in bed, which was not a loss since the fog was fairly think and the horizon could not be seen until two days later when we approached the Beagle Channel. The Adelie Penguin in image 13 looks like one of my ballet photographs! I like the iceberg series, including the last two in the first group of photographs. How was the vodka?